Greetings!! I'm Dr. Dennis Perkins! I am excited with our office and welcome you and your family. I've been an active dentist for more than 25 years. I graduated from the University of Michigan School of Dentistry and previously had a practice in Detroit for over 25 years. I sold my practice and moved to Ypsilanti, Michigan to start a "state of the art practice", which includes all phases of dentistry including smile design and implants. We also use digital x-ray technology which provide over 70% less x-ray exposure. I am a member of the Academy of General Dentistry and the Wolverine Dental Association. Our staff has numerous years of dental experience and have developed the capability to care for patients of all ages. Our goal is to provide you and your family with the highest quality of dental care. If you have any questions or concerns, please call me at 734-482-1300 or e-mail me at drperkins@southhurondental.com. We look forward to providing dental services and welcoming you and your family into our dental family! Hello!! I'm Dr. Steven Fletcher. I graduated from the University of Michigan School of Dentistry and I also have a Master of Business Administration degree from Florida Agricultural and Mechanical University. 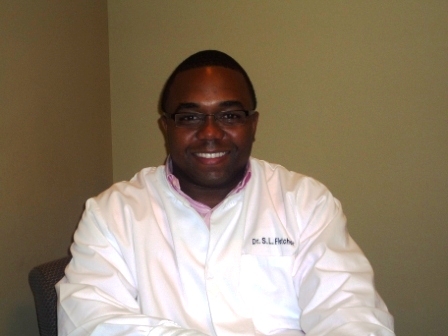 Originally from Jackson, Michigan, I am excited about providing dental care to residents of Southeastern Michigan. I joined the team at South Huron Dental primarily because of their overall commitment to the community in addition to, the emphasis placed on treating not only individuals, but the entire family (or as Dr. Perkins says " Putting Families First"). I am also excited about the opportunity to provide dental care in a state of the art facility with a proficient staff that has many years of dental experience and the knowledge to treat patients of all ages with the most modern techniques in dentistry. Feel free to contact me at the office or via e-mail at drfletcher@southhurondental.com if you have any questions or concerns. I look forward to meeting you and helping you achieve the smile you deserve!